Let’s face it; laundry isn’t the top of the list for favourite things to do. When I hear people say they ‘love doing laundry’ I wonder how much wine they’ve had. But what I’ve come to realize is this: it’s not so much the act of doing the laundry they love, it’s the space and functionality they get to do it in! 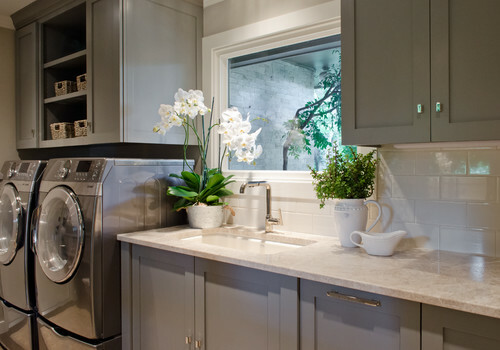 Yes, a good laundry room can make you love the task. 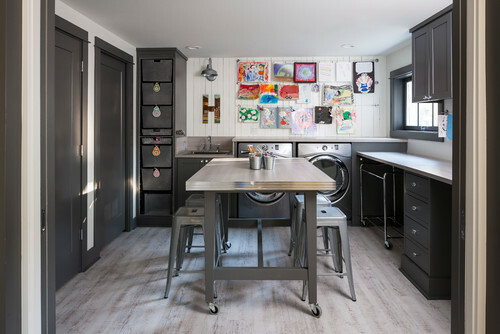 We’ve scoured the internet and rounded up our ten best ‘Pinterest-worthy’ laundry room trends to help you love your laundry room a little bit more. Green is ready for a laundry room invasion. 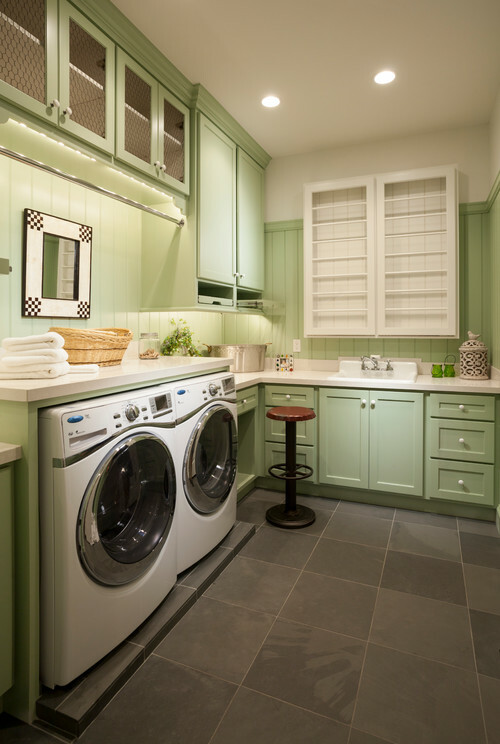 From a great humid room to store houseplants to painting the walls or cupboards sage green, green is what your laundry room is looking for. In 2019, you’re also going to see even more manufacturers creating energy efficient and more sustainable laundry options, in addition to all the great options already on the market. 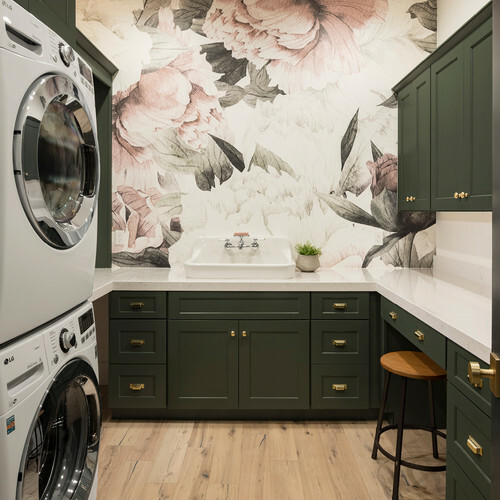 The dark green in the luxe laundry room below makes you want to stay a bit longer and linger with a cup of coffee in your hands, staring at the lovely floral wallpaper. This soft safe country laundry below is so cozy I could curl up in a laundry basket and read a book here. I bet ten bucks the kids would never find me! 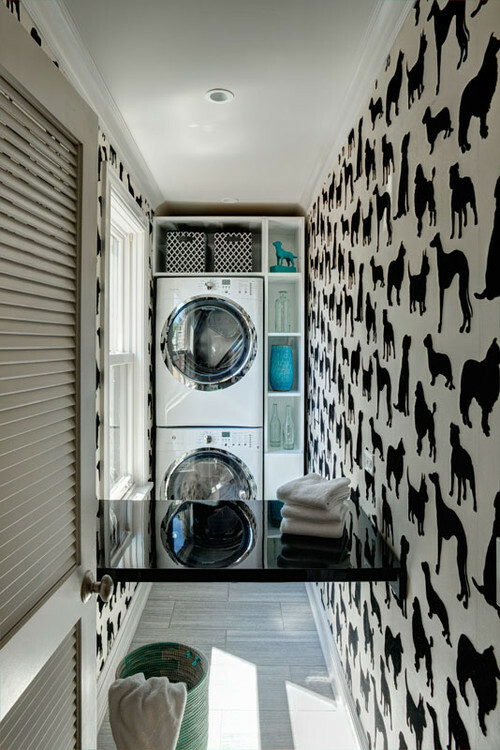 The laundry room can be so much more than just a space to clean out the spots; it can be where Spot gets cleaned too! 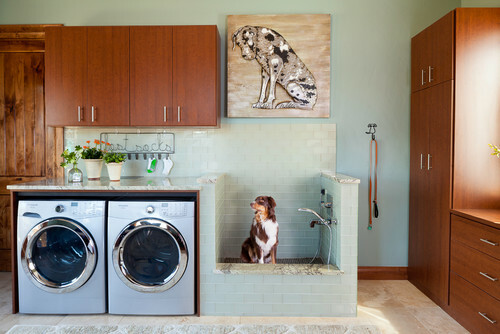 Making a laundry room into a wet room, ideal for cleaning pets is becoming more and more on trend. Why? 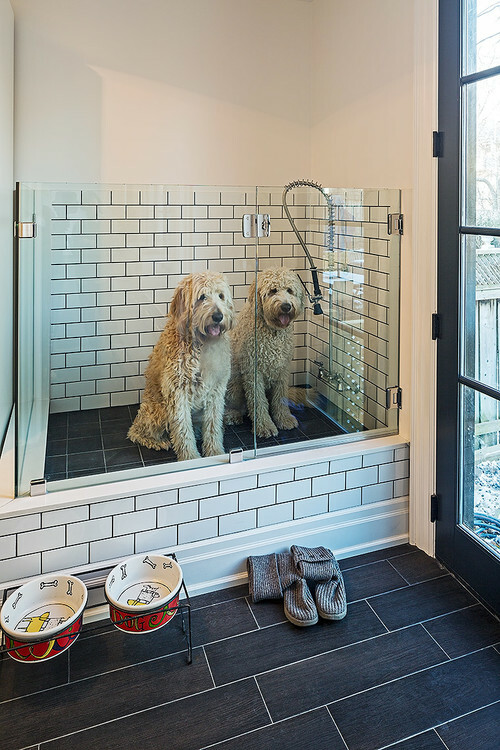 Because if you’ve ever walked in the door with a wet dog and three kids in wet snowsuits you’d know a dedicated wet room would make life almost as great as having wine out of the tap. 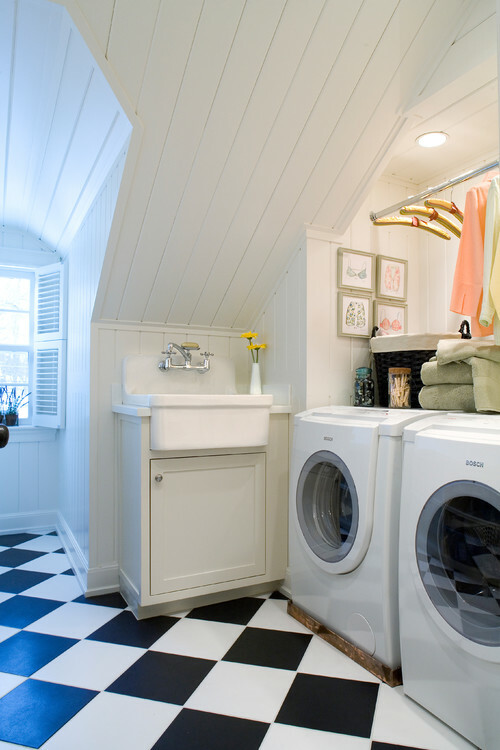 Use all the height your small laundry space can give you and rise up! Take advantage of the extra space and declutter the top of your work surface (leaving that for folding or ironing) by moving jugs, dryer sheets, and the change jar out of the way. Be sure to also think about your height and invest in risers for your laundry pair. If you want to love doing laundry it can’t be back breaking, so think about the best height of your machines as well as counters, sinks, and other commonly used areas. 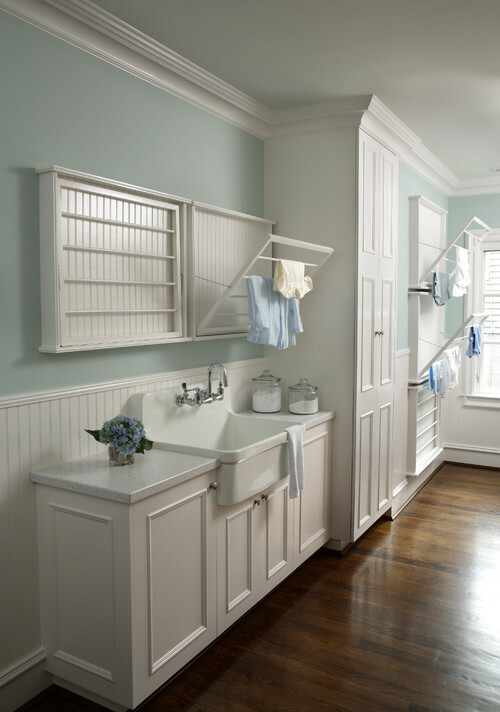 Even these simple shelves help keep items off the laundry pair and add extra storage for the room. 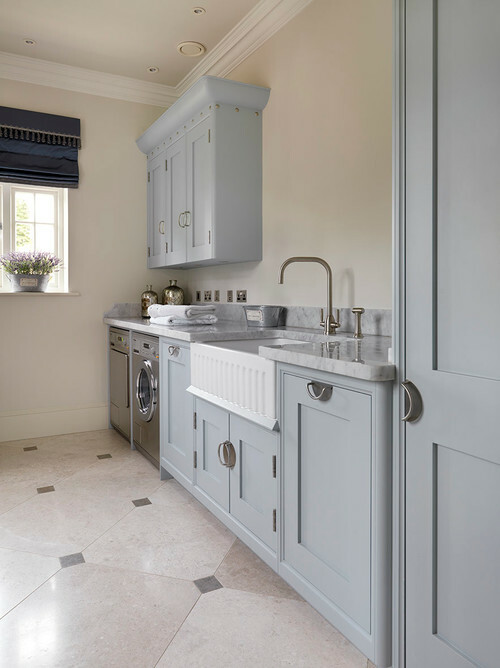 We’re seeing lots of laundry rooms as extensions to the kitchen, making it an ideal opportunity to add some uniformity by using the same cabinets in both places. 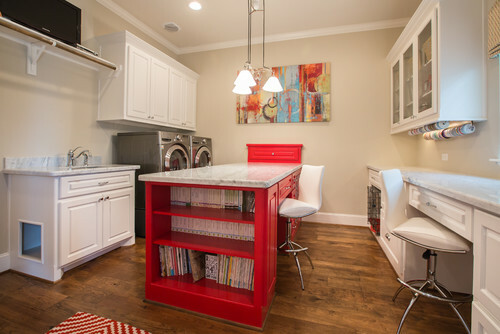 The pantry/laundry room combo is such a winning, just check out these great examples. The soaking sink is the most underrated sink in existence! How often do you find yourself using the kitchen sink (because it’s big enough!) to soak some delicates or deeply stained soccer uniforms and then forget and go to drain a boiling pot of pasta over top? Just me? Nope, I know I am not the only one. This is where a good laundry room sink comes in. But you can only have a sink if you’ve got the practical plumbing to go with it. 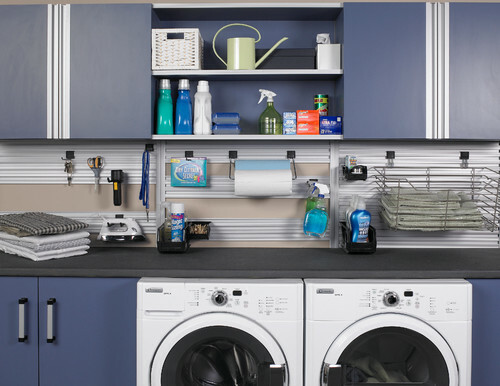 This is a worth investment and will make your laundry room so much more functional. Just like ‘going green’ we’re seeing an increased focus on using ‘cleaner’ cleaning products and this means using classics like vinegar and streamlining the cleaning products we use, reducing the number of spray bottles and making our lives simpler at the same time. 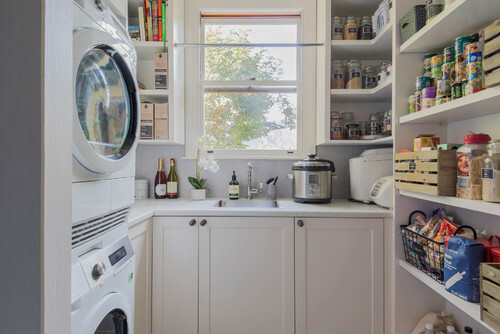 Blogger Chris Loves Julia has some amazing tips on how they streamlined their laundry room products this past winter. Read it here. 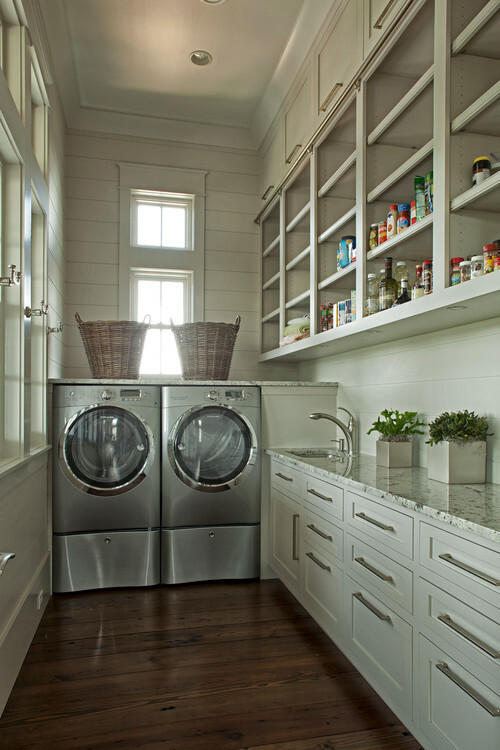 The laundry room is typically used to help clean up a mess, but why not use it to make a mess too? 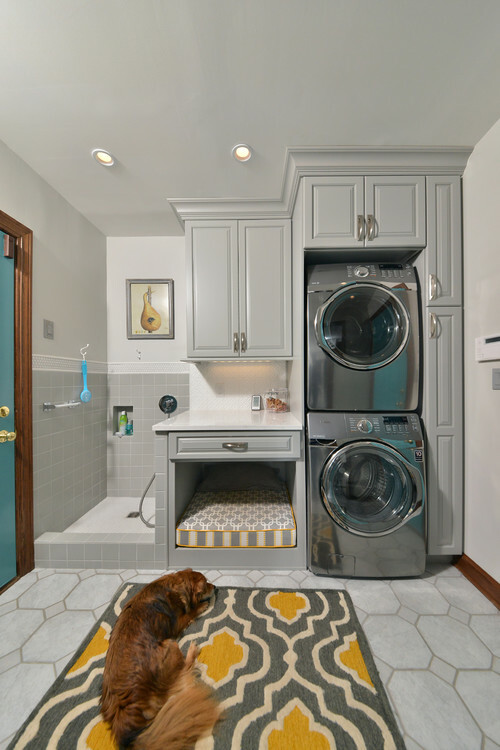 We’re seeing more and more laundry rooms becoming multipurpose. Just like making room for the family pooch and turning the laundry into a wet room, we’re also seeing lots of multi-purpose craft or mudroom + laundry room combos. We’re also seeing laundry luxe it up with sparkling features and glam touches. 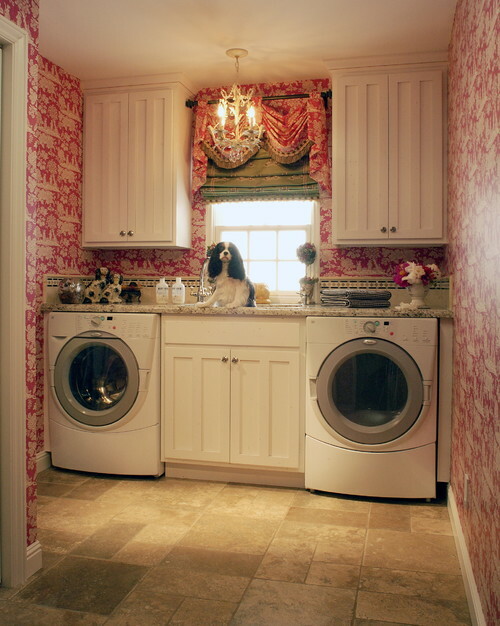 Toile and the sparkly chandelier (not to mention the glamourous pooch) make this laundry room feel like Versailles. 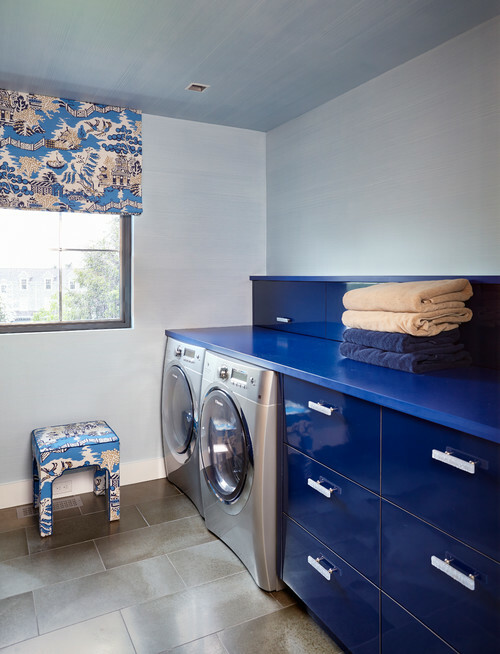 Whether it’s a crazy bold door colour, or a giant painting or décor item, laundry rooms are looking for a little unexpected POP. The blue and the awesome fabrics combine to make this room POP. 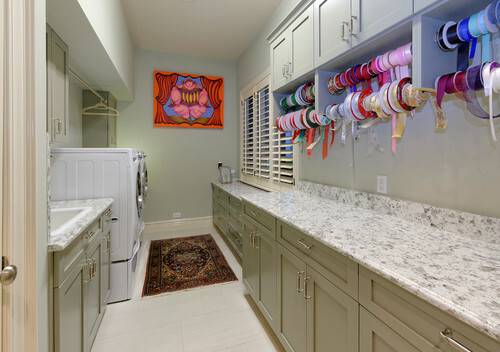 The awesome art in the laundry room just makes the room feel more civilized, don’t you think? 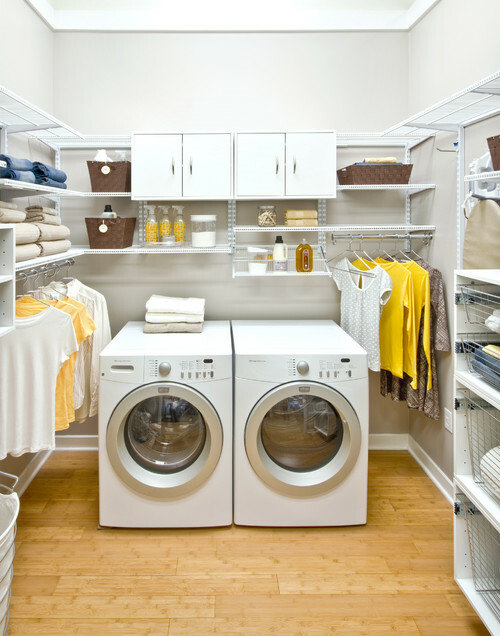 Better Homes and Gardens has some great tips on keeping your laundry room organized. 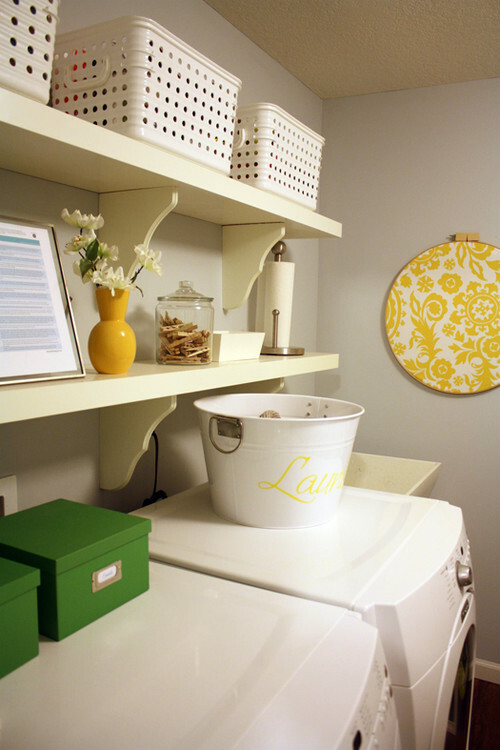 Make your laundry room clever not cluttered. 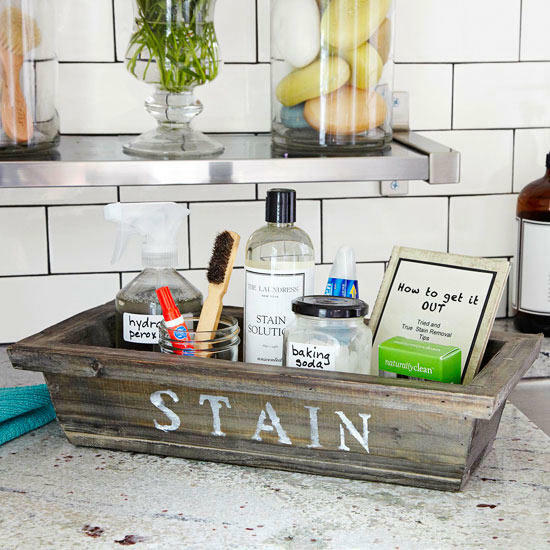 We love this idea for a stain remover station – because we all know that’s the stuff we reach for most! What trend are you most excited to take on this year?